Gaffer Tapes | J.V. 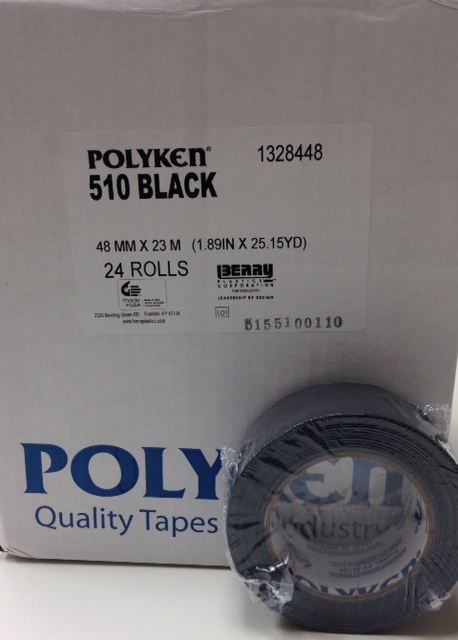 Converting Company, Inc.
Polyken 510 Black now in convenient 2″ x 25 yd. shrink wrapped rolls! Perfect for your shelf displays or tool boxes! As low as $5.80 / roll ! Premium Grade 30 Yard Gaffers Tape. JVCC Gaff30 is a premium-grade vinyl coated cloth gaffer’s tape used in A/V, TV, photography and motion picture industries to hold wires, light and props. Will not leave adhesive residue behind when removed. Convenient and inexpensive. Easy to hold and use 30 yard roll. 12 mils thick and 50 oz/in. adhesion. A best seller on both coasts. Colors: Black, White, Gray. Priced as low as $6.68 a roll ! A Low Gloss finish Gaffer-Style Duct Tape. JVCC J90 is a matte-finish polyethylene coated cloth tape with an adhesive that removes residue free from most surfaces. A low cost alternative to traditional vinyl coated cloth gaffer tapes. It is also commonly referred to as AV cord tape. It is suitable for entertainment type applications (film, concerts, music, DJ’s, conventions, trade shows, photography, etc.) where minimal visibility of tape is desired. Used for protecting and anchoring cable, wires and electrical cords; sealing of equipment cases and film canisters; and in stage set-ups for marking placement (i.e. “spike” tape). Also suitable as a book binding tape for seaming and reinforcement. Conforms well to irregular surfaces, and will not twist or curl. Has excellent water, vapor and abrasion resistance. 11.8 mils thick and 29 oz/in. adhesion. Colors: Black, White, Gray, Brown, Burgundy, Dark Green, Dark Blue, Light Blue, Olive Drab, Red, Yellow. Priced as low as $7.78 a roll for 2″ x 60 yds. ! 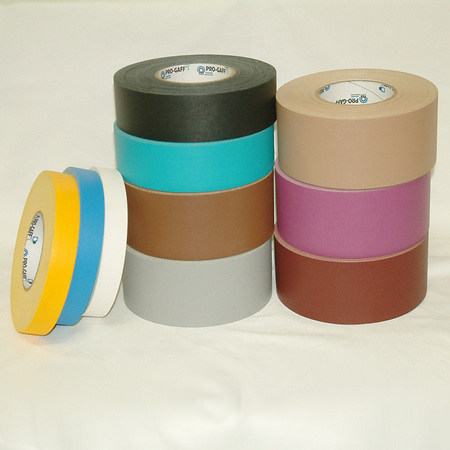 125 Economy Grade Gaffers Tape is a high quality, waterproof, vinyl coated cloth tape single coated with a natural rubber based adhesive. One of the most economical gaffers tape available. With a low to moderate tack and an extremely low gloss backing Scapa 125 Gaffers Tape is the ideal choice for people who do not need a gaffers tape with aggressive adhesion. Scapa 125 is easy to unwind and will not leave residue behind. Applications include color coding both on stages and gym floors, export packaging, and use as a first aid tape. 11 mils thick and 28 oz/in. adhesion. Colors: Black, White, Gray. Priced as low as $10.92 a roll for 2″ x 60 yds. ! 225 Premium Gaffers Tape is a high quality, waterproof, vinyl-coated cloth tape single-coated with a natural rubber based adhesive. Scapa 225 provides good tack, but it is also designed to remove adhesive-residue free. It also features a matte, non-reflective backing that has the lowest gloss of any gaffers tape. Applications include bundling, waterproof wrapping, packaging and color coding. 12 mils thick and 50 oz/in. adhesion. Colors: Black, White, Gray. Priced as low as $11.31 a roll for 2″ x 60 yds. ! Premium Vinyl Coated Tape – Gaffer’s Tape. Heavy-duty vinyl coated moisture-resistant cloth backing with excellent flexibility. High tack tape with excellent adhesion for superior performance. Non-reflective backing for low gloss. Retains flexibility and conformability in both low and high temperature applications. 11.5 mils thick and 50 oz/in. adhesion. NOW AVAILABLE IN NEON COLORS! Other uses are : Bookbinding Tape. Bus seat repair tape. Wrapping or bundling wire, metals, plastics. Protecting and anchoring electrical wiring. Moisture and dust-proof sealing of equipment cases and/or film canisters. Designed for exterior weather and temperature applications. Certifications:UL723 – Tested in accordance with UL723 ; LEED – Contributes toward satisfying EQ Credit 4.1 (Low Emitting Materials) Colors: Black, White, Gray, Brown, Dark Green, Red, Yellow, Neon Green, Neon Orange, Neon Pink, Neon Yellow. Priced as low as $11.82 a roll for 2″ x 55 yds. ! Industrial grade vinyl coated gaffer’s tape.Synthetic rubber adhesive. Waterproof backing. Conformable.Excellent weathering features. 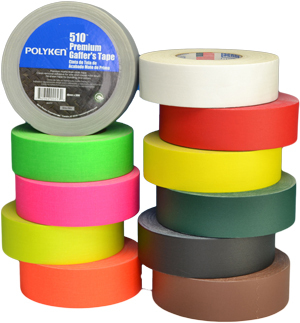 Available in a variety of colors, used for color coding, seaming, bundling, and protection. Also used as a gaffer’s tape in the Arts & Entertainment industry to hold wiring, lighting, and props. May be used as an HVAC line set tape. 10.75 mils thick and 80 oz/in. adhesion. Colors: Black, White, Gray, Brown, Dark Green, Dark Blue, Olive Drab, Red, Yellow. Priced as low as $16.62 a roll for 2″ x 55 yds. ! Professional gaffer’s coated cloth tape.Clean removal. 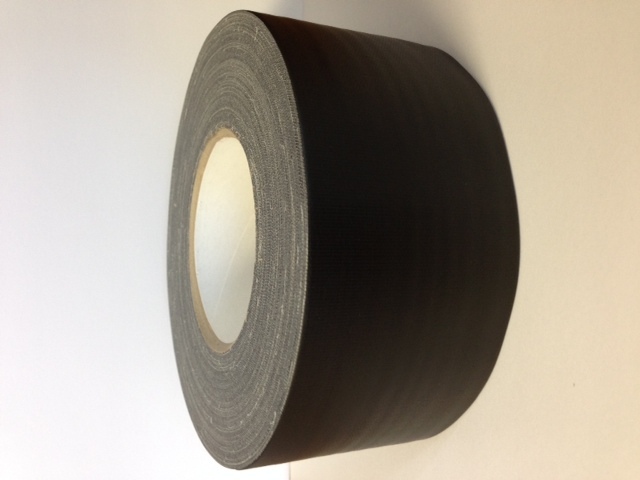 A vinyl-coated gaffer’s tape used in the Arts & Entertainment industry to hold wiring, lighting, and props. Other applications include color-coding, seaming, bundling, and protection.11.5 mils thick and 77 oz/in. adhesion. Meets :CID A-A-1586 A Colors: Black, White, Gray. Priced as low as $15.57 a roll for 2″ x 55 yds. ! Professional Grade coated cloth tape. Waterproof. High tensile strength. A premium industrial grade, matte-finish, coated cloth tape used wherever a strong, abrasion resistant, waterproof cloth tape is required. Typical applications include protection, holding, sealing, packaging, splicing, bundling, and repairing. 14 mils thick and 60 oz/in. adhesion. Meets: A-A-1586 A Colors: Black, White, Gray. Priced as low as $22.48 a roll for 2″ x 50 yds. ! Premium grade coated cloth tape. Waterproof. High tensile strength. Used for color-coding of piping, equipment, and tools. Other uses include book binding, vinyl repair, decorative and gaffer’s applications. 13.5 mils thick and 59 oz/in. adhesion. Meets: A-A-1586 A; PM-85 Tested; T-428 Colors: Black, White, Red. Priced as low as $35.50 a roll for 2″ x 60 yds. ! Pro Gaff is a matte cloth vinyl coated gaffer tape with a rubber based adhesive system. Temporary holding of light fixtures, wire and cable hold down, marking and labeling equipment cases. High visibility colors for marking of stairs, exits or sets. Dance floor splicing and bundling of cables. 18 Available colors make it easy to match Pro Gaff to any carpet color. 12 mils thick and 60 oz/in. adhesion. Colors: Black, White, Gray, Brown, Burgundy, Dark Green, Dark Blue, Electric Blue, Olive Drab, Purple, Red, Tan, Teal, Yellow, Neon Green, Neon Orange, Neon Pink, Neon Yellow. Priced as low as $13.53 a roll for 2″ x 55 yds. ! We stock all the brands in all colors and sizes. In Philadelphia and Las Vegas.